Melding refers to a series of cards that, when played together, yield automatic point gains in a game. In Pinochle, melding is a large part of the game's scoring system, and can even end a hand before it properly begins, depending on what melds other players have. Melding in general has a number of card combinations that can yield point gains that lead you closer to winning, but there are five major melds common to Pinochle: Around, Marriage, Run, Dix, and Pinochle. A collection of four of the same Royal cards from different suits can yield hundreds of points, depending on the suit, and is referred to as an Around. For example, if you have the Jack of Spades, Jack of Clubs, Jack of Hearts and Jack of Diamonds, you have Jacks Around. An Around can yield anywhere from 40 points (Jacks Around) to 1000 points with Double Aces Around. A Double Around refers to eight of the same card from different suits (i.e. 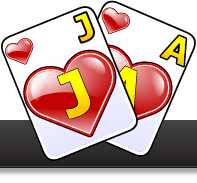 both Jack of Spades, both Clubs, both Hearts and both Diamonds since Pinochle is played with a combined deck of cards with two of each suit's cards from nine to the Ace for a total of 48 cards). Quite fittingly, a marriage refers to the King and Queen of the same card suit. For example, if you have in your hand the King of Hearts and Queen of Hearts you have a marriage. A Royal Marriage refers to the same combination but for cards within the Trump suit. A marriage meld can yield 20 points for cards outside the Trump suit and 40 points for cards within the Trump suit. For example, if the Trump suit is Clubs and you have the King of Clubs and Queen of Clubs, you would receive 40 points instead of the 20 points you'd receive for the King of Hearts and Queen of Hearts, if they are not designated as the Trump suit. A Run can only be achieved with cards from the Trump suit. It refers to the Jack, Queen, King and Ace of cards in the Trump suit. For example, if the Trump suit is Diamonds, and you have the Ace, King, Queen and Jack, you have a Run. A Run is worth 15 points, but if you have an additional King, Queen or both of these cards from the Trump suit, you can score up to 230 points. A Double Run, with both Aces, Kings, Queens and Jacks from the Trump suit is worth 1500 points. A Dix (a French word pronounced as deese and meaning 10) refers to the nine in the Trump suit. It is worth 10 points. The final major meld for Pinochle is the namesake of the game. A Pinochle meld refers to the Jack of Diamonds and the Queen of Spades. A Pinochle is worth 40 points and can be doubled like some of the other melds in the Pinochle game. A Double Pinochle is both Jack of Diamonds and both Queen of Spades and is worth 300 points.